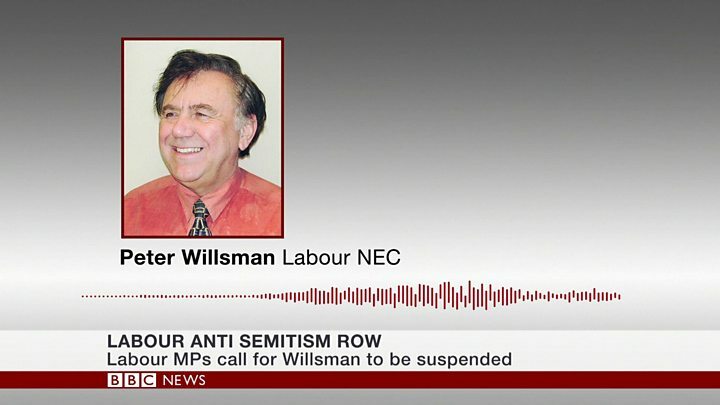 A Labour Party official who suggested Jewish "Trump fanatics" were behind accusations of anti-Semitism in Labour ranks has been re-elected to the party's ruling body.Peter Willsman was criticised when a recording of his remarks emerged in July, and the pro-Corbyn Momentum group withdrew its backing for him.But he is one of nine people elected to Labour's National Executive Committee.The remaining eight members of Momentum's slate were also elected. He later apologised and said not all his remarks were accurately reported and that he would be referring himself for equalities training.Momentum founder Jon Lansman has also been re-elected to the executive committee. Comedian and longstanding Labour activist Eddie Izzard missed out, finishing in 10th place. Despite the best efforts of the haters and the smearers it's a clean sweep for the #JC9, Yes 9, in Labour's NEC election. Labour's NEC is expected to vote on Tuesday on whether to adopt, in full, the International Holocaust Remembrance Alliance's anti-Semitism guidelines.Labour's code of conduct, which does not include all of the IHRA examples of anti-Semitism, has caused a drawn-out row within the party. » What's the anti-Semitism row doing to Labour?